France's Rhone River polluted by PCB Chemical Waste: Fishing ban destroys livelihoods of local fishermen and destroys staple diet of poor. 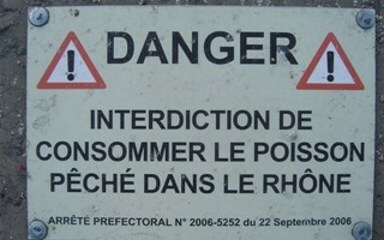 In 2007 the French government has banned the consumption of fish (local species include bream, pikeperch, carp and catfish) from the entire Rhône. This river is one of the major rivers of Europe and has twice the average discharge of France’s longest river Loire. The fish are today unsafe to eat. This news reached a significant international awareness (e.g. The Guardian 2008, BBC 2008) even though this was not a new phenomenon. Industrial chemicals used in generators and other electrical equipment had been leaking toxic PCB chemicals into the Rhone River for a long time even though they are banned since 1987. PCB causes various diseases in humans and animals including poor cognitive development in children, malignant melanoma, and rare liver cancers. Many of uncontrolled pollution in France’s Rhone River have taken their toll with the discovery of PCB levels 10-12 times the safe limit in the river’s fish. The ban of fishing has affected at least 20 fishermen that needed to find a new job. The freshwater fish - often sold for €2 (£1.50) a kilo - is a staple for poor people and many immigrants as they cannot afford the more expensive sea fish. 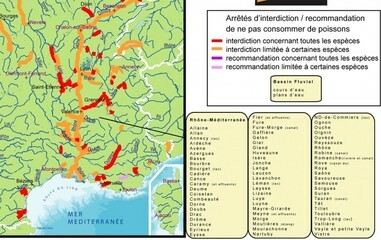 WWF have called the widespread pollution of the Rhône, "The French Chernobyl". The WWF has launched a blood sampling campaign to determine the PCB level of 52 people, including 42 living in the Rhone delta. The results confirm an average rate of 69.9 picograms of PCBs per gram of fat, more than four times the average rate of people living far from the Rhone and not eating fish (Legrand, 2008). The French government has then announced a research program co-financed by the industry. Suez Environnement led the project, which involved laboratories, researchers, industrialists, and SMEs (Bertrant, 2008). Ten years after the banning on fishing, the PCB is not completely eliminated. Two decontamination plants have been in charge of cleaning it up. However many PCB are very persistent and insoluble in water. Therefore cleaning up is very difficult and PCBs will remain for a long time in the Rhone River. New other pollutants occurred after the floods caused by heavy rainfall in January 2018. As with each flood, the river has carried its silt but also a worrying cocktail of PCBs, heavy metals, solvents flame retardant compounds, pesticides and nitrates resulting from atmospheric, industrial and agricultural pollution, and even from impermeable garments (Médias Citoyens Diois 2018). 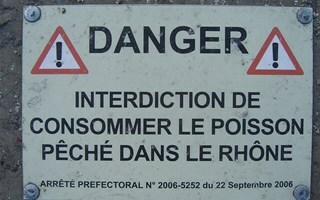 Project Details In 2007 the French government banned the consumption of fish from entire French Rhone River because of high pollution levels. There have been problems with PCB contamination since the 1980s. PCB levels at 10-12 times the safe limit in the river’s fish. Since 1967 about 70 tons of PCB had been released into the Rhone River. 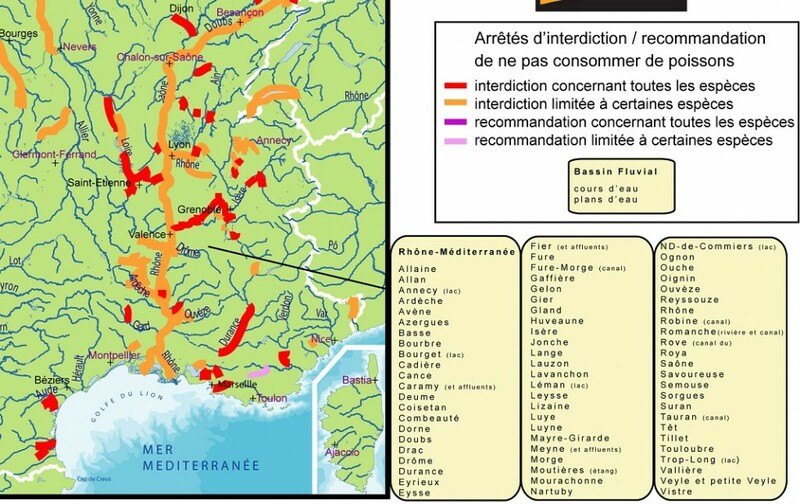 The Rhône River drains a catchment area of 98,000 km² in southeastern France. It has a 512 kilometer main stem downstream of Lake Geneva and flows to the Mediterranean Sea. Large urbanized areas (including Lyon, Valence, Montélimar, Orange, Avignon and Arles) occupy its valley. At least 20 fishermen needed to find a new job, whereas the functions linked to leisure activities were saved, despite recreational anglers having to stop consuming their fish. In the recent years PCB level have decreased. However the half-life (moment at which the substance has lost half of its toxity) varies from 94 days to 2700 years depending on the molecules and PCBs are very insoluble in water. Furthermore new other pollutants occurred after the floods caused by heavy rainfall in January 2018. As with each flood, the river has carried its silt but also a worrying cocktail of PCBs, heavy metals, solvents flame retardant compounds, pesticides and nitrates resulting from atmospheric, industrial and agricultural pollution, and even from impermeable garments (Médias Citoyens Diois 2018). Company Names or State Enterprises Trédi from France - En raison de la spécificité de son activité, l'entreprise Trédi, seule autorisée en Rhône-Alpes à rejeter des PCB, est apparue comme un symbole de cette pollution au moment où le Rhône était de nouveau le théâtre d'une crise importante. Malgré une contribution historique incontestable à la pollution du fleuve, elle ne peut cependant être tenue pour unique responsable. Development of Alternatives The cleaning up of the River and removing of remaining devices containing PCB has been the reaction of the state to the environmental catastrophe of PCB contamination. Suez Environnement is participating with up to €3m, the state and the regions invested €5.7m. French regulations (Decree of January 18, 2001) implements European law (Directive 96/99/EC of September 16, 1996) and provides for carrying out a plan to eliminate PCBs, in order to remove the last 500,000 devices containing PCBs from the market. With respect to the clean up of contaminated sites, only some action has been taken to date in France on polluted sediments of the major rivers. Along with the need to step up the reduction of PCB waste in water, and to support consumers and fishermen, the goal of the “PCB AXELERA” Project is to work toward the development of a full range of analytical tools and technologies for treating PCB pollution. Why? Explain briefly. The freshwater fishermen banned from selling fish have received no compensation - lost livelihoods have caused mental health problems and poverty. Many local along the Rhone river have no alternatives to their contaminated food, as they cannot afford higher priced safe food.